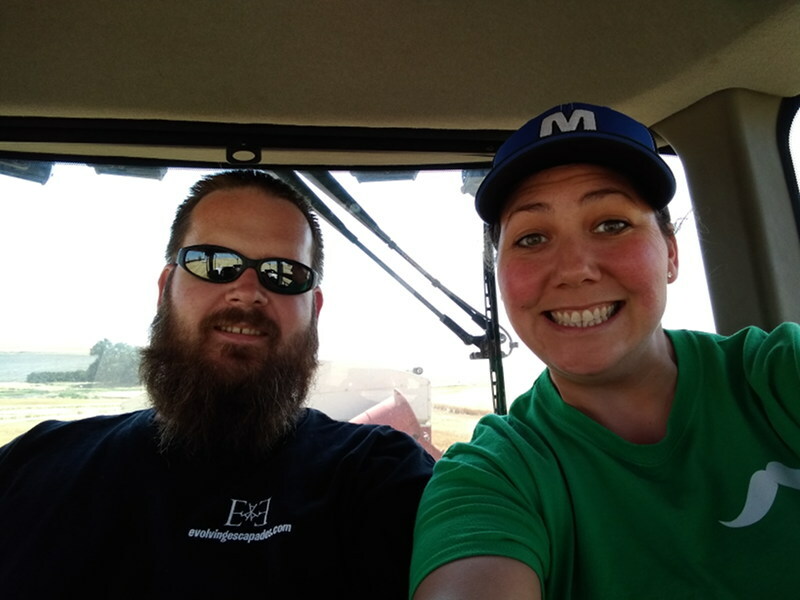 Months ago, when we were just starting our evolving escapades, I had lunch with an old friend who is a farmer (among other things) who was in need of a driver for the upcoming wheat harvest. Now, after spending so much on tires and batteries in the last 6 months, we decided it might be good to replenish the coffers before heading south in the RV. As we begin this new life, switching from saving to spending is far more challenging than we had anticipated. Planning for this adventure, we’ve spent quite a few years saving 65% of our gross income and investing it in the stock market. So, dropping $5,000 on batteries and tires was difficult, but they needed to be replaced. We knew part of this traveling lifestyle would require small amounts of work here and there. Some of the maintenance items with RVing can be quite expensive. 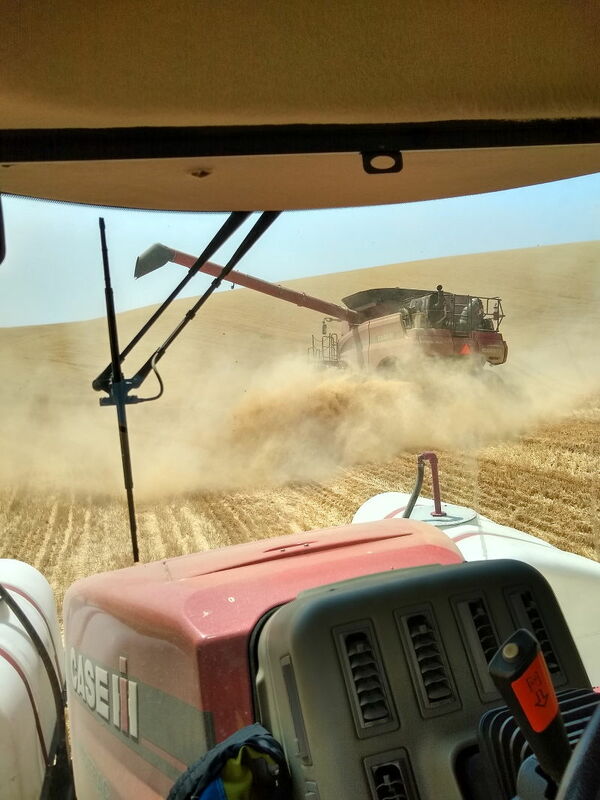 So, I agreed to work the wheat harvest in Eastern Washington as a truck driver. I worked for many different farmers during my youth, but none in the last 18 years. A lot has changed since I last drove truck during harvest back in 2000. All the smaller trucks that I remember being used “back in my day” (yes, I’m starting to sound old) have been replaced by semi’s, and now they use bank out wagons which are pulled by a tractor to move the grain from the combine to the trucks. I was a little apprehensive since I’ve never driven a semi before, but I knew I would learn it quickly, and I did. For those who don’t know how harvest works, the combine cuts the wheat and separates the grain from the chaff and straw. 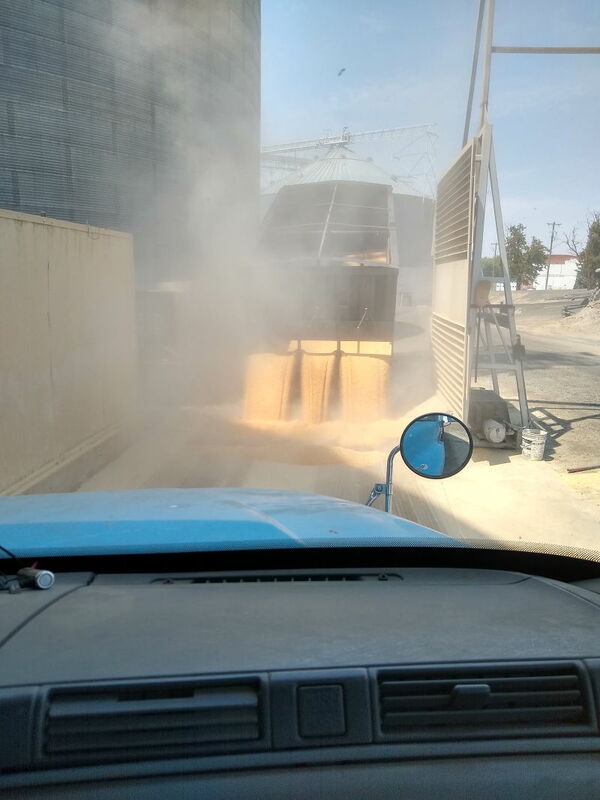 Then, dumps the grain into the bank out wagon when the hopper is full. A bank out wagon is a trailer that holds enough grain to fill most trucks (depending on model and size), it is towed by a tractor. When the wagon gets full, it takes the grain to where the trucks are parked and unloads the grain into them. Then the trucks take the grain to the elevator for storage. The truck I drove was an older Freightliner with a dump bed on the back. One of the best parts of this truck was that it had a newer a/c unit in it. I knew before hand that I would probably be towing a pup trailer behind the truck. 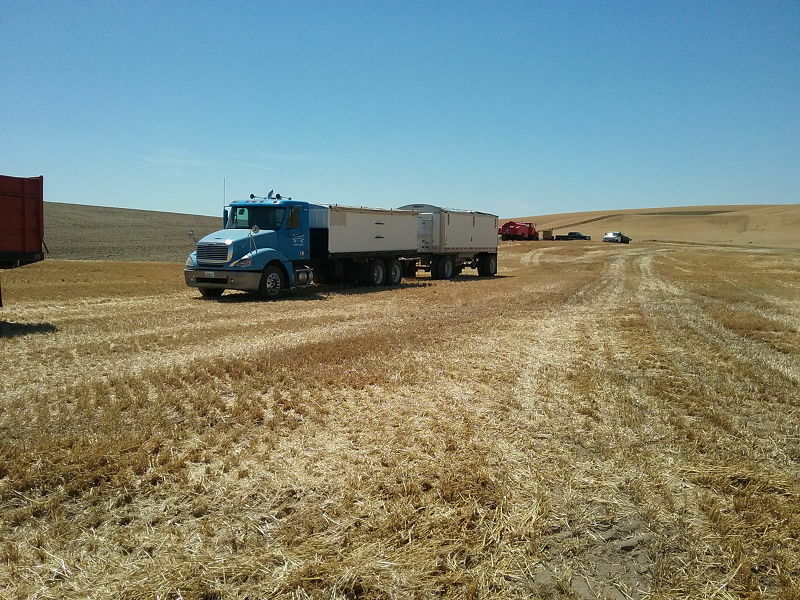 The trailer and grain weight would add about another 40,000 lbs when loaded to the total weight of the truck. Most loads were in the 90,000 lbs+ range in total weight, which would average 60-65,000 lbs of grain per load. While it was a bit intimidating to learn to drive a semi while hauling this much weight at the beginning, it really wasn’t difficult. It just took a little time to learn the shifting points and remember to increase the rpms up during a downshift. The RV has a two stage Jake Brake, so I was already familiar with using an engine brake. Another perk to this job was that it came with room and board. This really helped, my commute would have been about 30 minutes each way and would add an additional hour to an already long day. The days were normally about 13 hours. While 13 hours might sound like a lot, the days do seem to go by fast. The job isn’t one that is physically demanding, you just sit there and drive (when things aren’t broke down). Thirteen hours doing a physically demanding job would be a different story. Some days can be longer than others, this one went way into the night due to a breakdown. 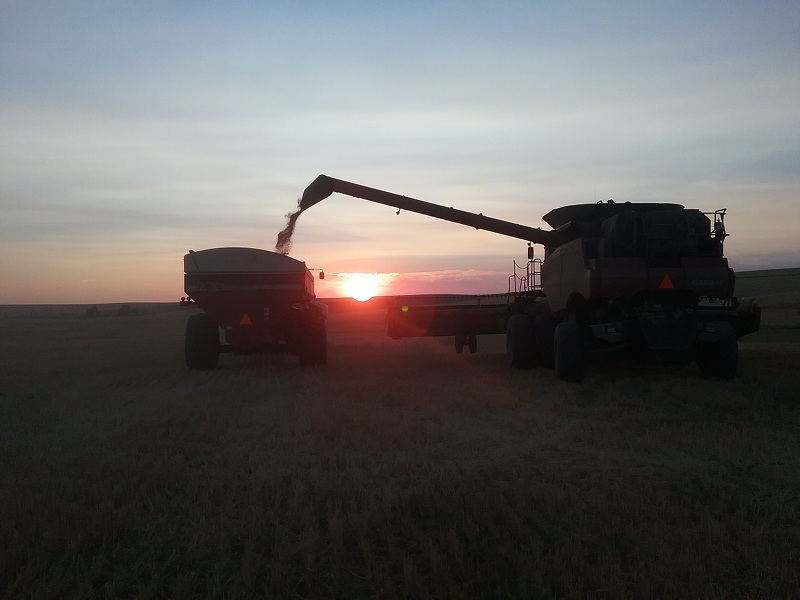 One thing I have always enjoyed about harvest was the sunsets. Almost everyday was sunny and clear, that gave us a different and amazing sunset every evening. You are in a different spot everyday, so the sun was setting over a different hill every evening. Most people are sitting at home inside their house watching TV or playing around online and don’t even remember how spectacular a sunset can be. If this is you, take a look at what you’re missing. 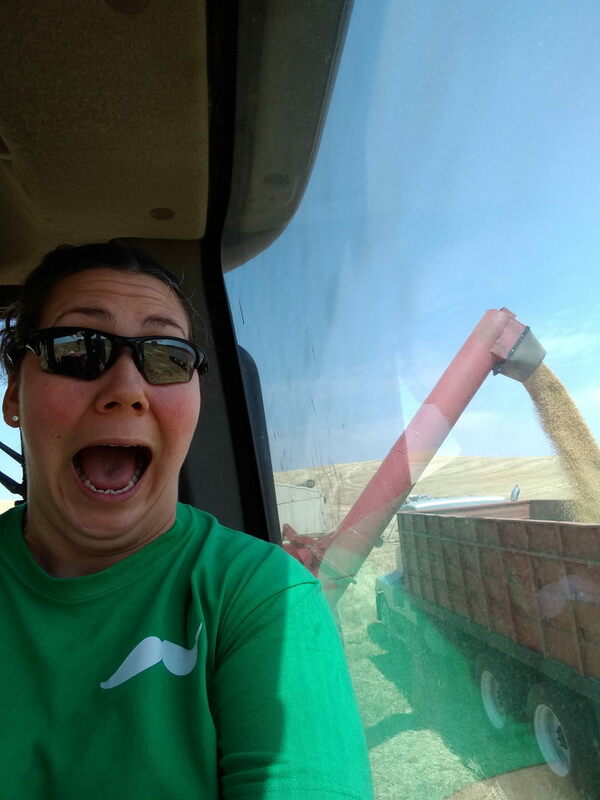 About halfway through harvest, I changed positions and started driving the bank out wagon (tractor). I wasn’t expecting to drive the bank out wagon but when given the opportunity to try something new, sign me up. 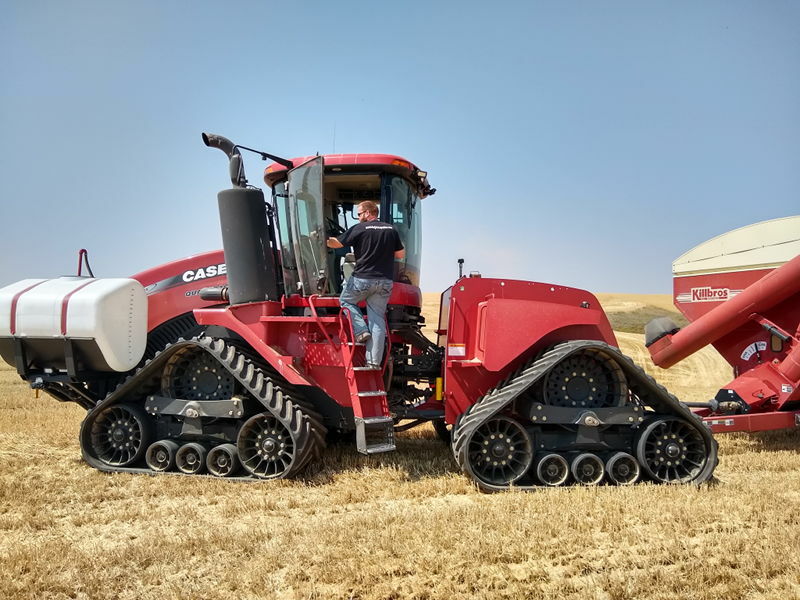 I had driven many different types of tractors growing up, so this wasn’t anything new. The tricky part was how close to get to the truck, you need to be dumping right into the center of the bed in order to load the truck properly. Also, learning the spacing for dumping “on the go”, this is when the combine dumps into the wagon without stopping. The combine keeps cutting while unloading into the bank out wagon, this requires the combine and wagon to be very close together. There were some perks as well, the air conditioning was better, it had XM radio, and my tablet could sync with the radio so I could listen to podcasts I’d downloaded the night before. Joe Rogan podcasts and some unfiltered comedians on XM radio can sure help make the long hours more enjoyable. There were multiple times I was laughing out loud by myself as I drove around in a field at 5 mph. Don’t forget the all important bring your wife to work day. A great addition to any day! 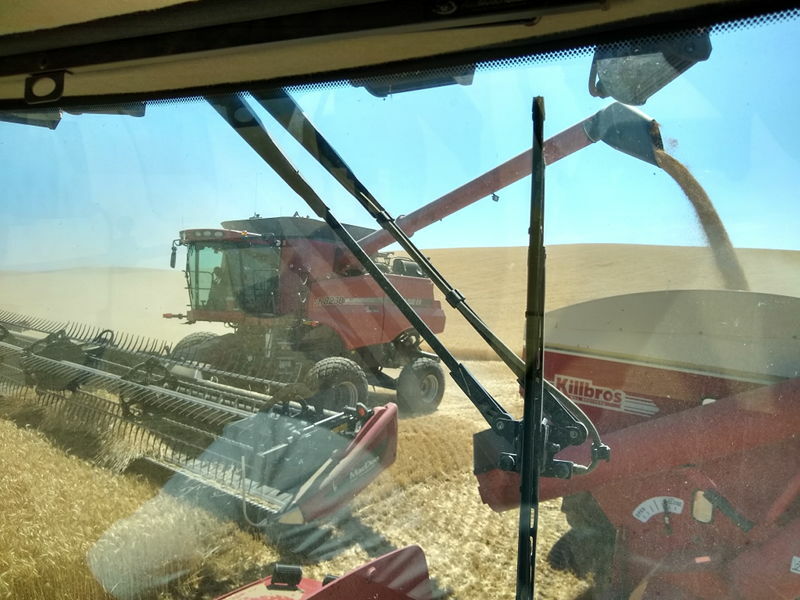 I was told that the average harvest on this farm was 16 days, but could be longer or shorter depending on the yield of the crop and breakdowns. We ended up working 17 days straight, this included a couple breakdowns. It really didn’t feel like 17 days, once we got into a groove the days just seem to flow. This was a great experience, one I might just do again next year. This is a cool seasonal job that many people haven’t ever thought about. Do you know of any other fun seasonal jobs out there? If you do, leave a comment below and I might just try it out sometime. I really like this article. Getting a first-person look into things most of us no little about is always interesting. Nice photos as well. Thanks for sharing. Thanks Hunter! There are so many interesting jobs or things to do that many people have never heard of or thought about. I just wanted to share an interesting job I knew of and hopefully it will lead to many more that I don’t know of, yet. Great to hear from you! Interesting perspective little brother. I am truly happy that you were able to reacquaint yourself with the annual harvest tradition. 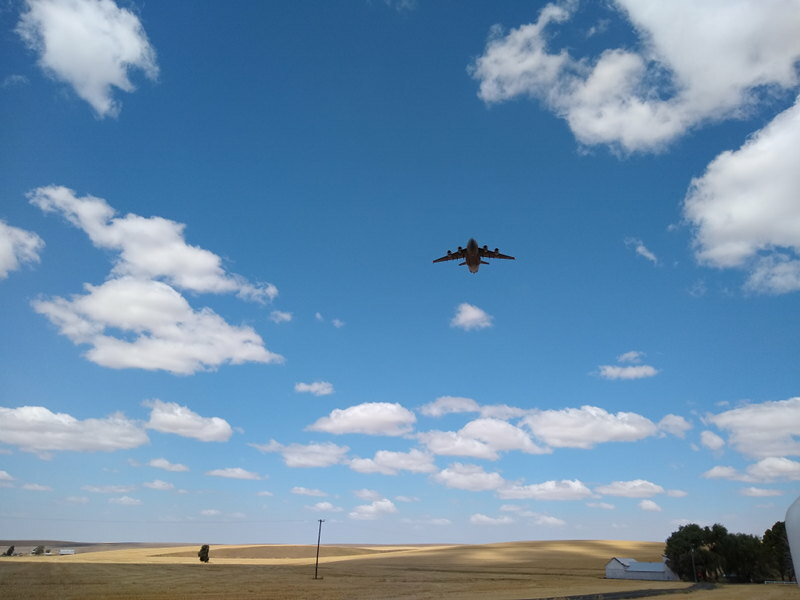 You are absolutely correct in expressing that there is a calm stillness to the Palouse Country hilltops around sunset during harvest. The dull drone of machines still cutting in the distance as the sun fades into the horizon always was my favorite end to a long day. Now that you mention the evenings calm stillness, that reminds me of the smell also. The smell of the fresh cut crop that lingers in the still air. I forgot to mention that part. 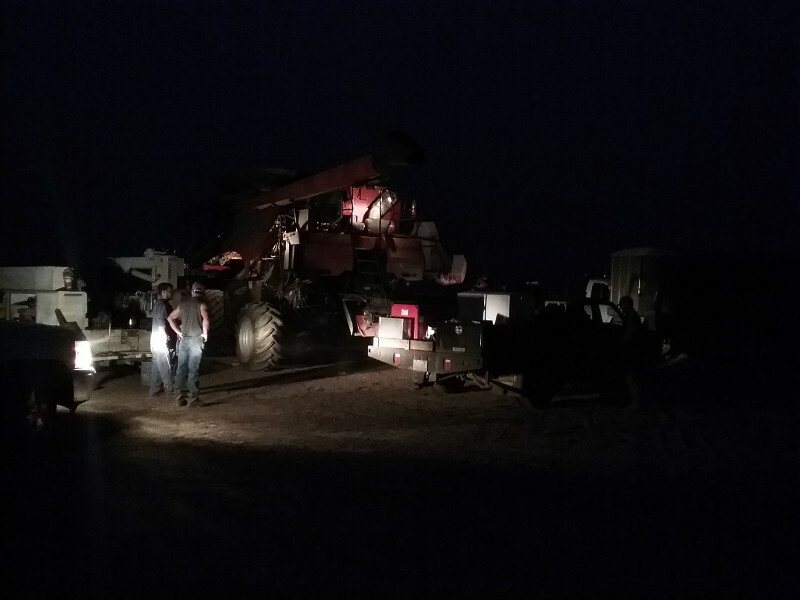 Half the harvest season I was driving blue (Freightliner), the other half was red. But, the green going into my pocket was the color I was really interested in. You could say I’m color neutral. Thanks for stopping by Gwen. We were listening to the Fire Drill Podcast with you and J talking to Justin from Root Of Good as you we drove into Montana a week ago. Your podcast is great, keep up the good work! Adam! This is a cool gig. Totally agree about the sunsets, that’s one thing I’m looking forward to once we start full-timing. I do enjoy driving rigs and listening to podcasts, so this could be a good fit for me once we pull the trigger. Hope you guys are having a blast out there! It’s not a job for everybody, but I had a great time and it sounds like you would be a good fit also. Once you pull the trigger, let me know if I can help. Someone would be lucky to have you. We have had a great time in Montana, sadly it’s coming to an end. But, it’s time to head south, snow is in the forecast. We should be in Moab within a week or so. Great to hear from you! I hope you and Christina are doing well. Somewhere out in the desert near Quartzsite! Contact Us for the location. Evolvingescapades.com is participant in the Amazon Services LLC Associates Program, an affiliate advertising program designed to provide a means for us to earn fees by linking to Amazon.com and affiliated sites. Copyright © 2019 Evolving Escapades. All Rights Reserved.